Rob Vetter lives in Seattle’s Rainier Valley surrounded by parks, playfields and Lake Washington. It’s no wonder that his miniature landscapes evoke glimpses of the Northwest remind us of recent strolls through the woods and walks by the water. 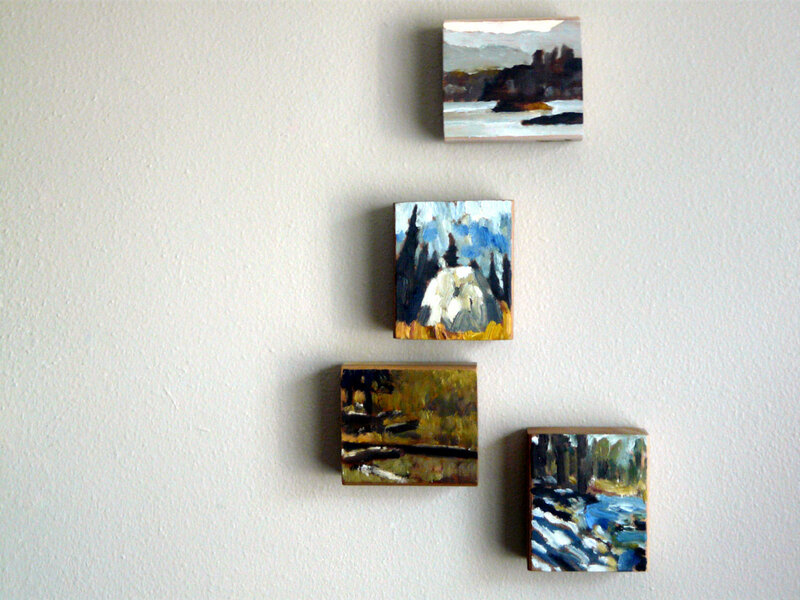 These little gems are oil paint on blocks of wood that can be grouped on a gallery wall or stacked one on top of another. 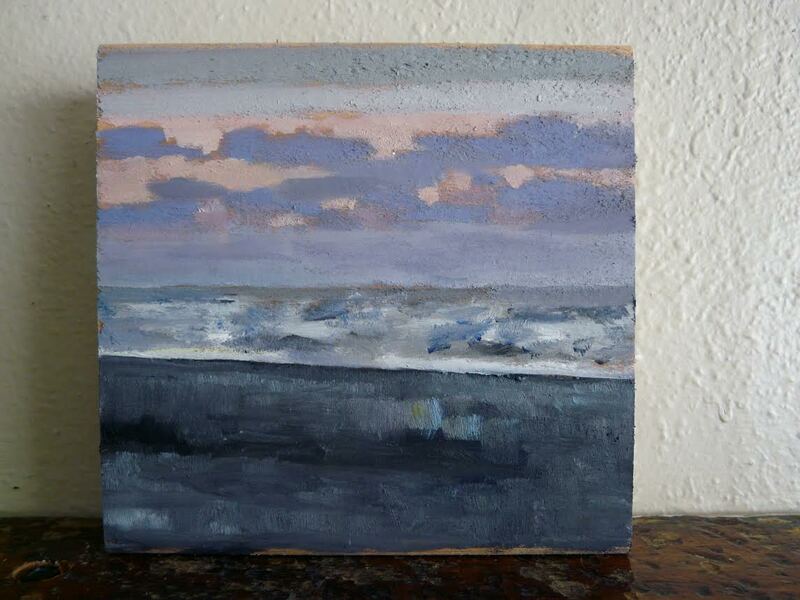 Your landscape paintings are all miniature, and done on wood. How did you come to this format? Whenever I’ve taken a small impromptu sketch and made a larger, more meticulous painting out of it, I’ve failed. For me, painting is all about filling the given space – when I’ve filled the space, it’s done. From that standpoint, the miniature has obvious appeal. But I also love the idea of coming across something, rather than being hit over the head by it the minute I walk in the room. And miniatures are still objects, they belong to that category epitomized by the jewel, which never needs to be explained. 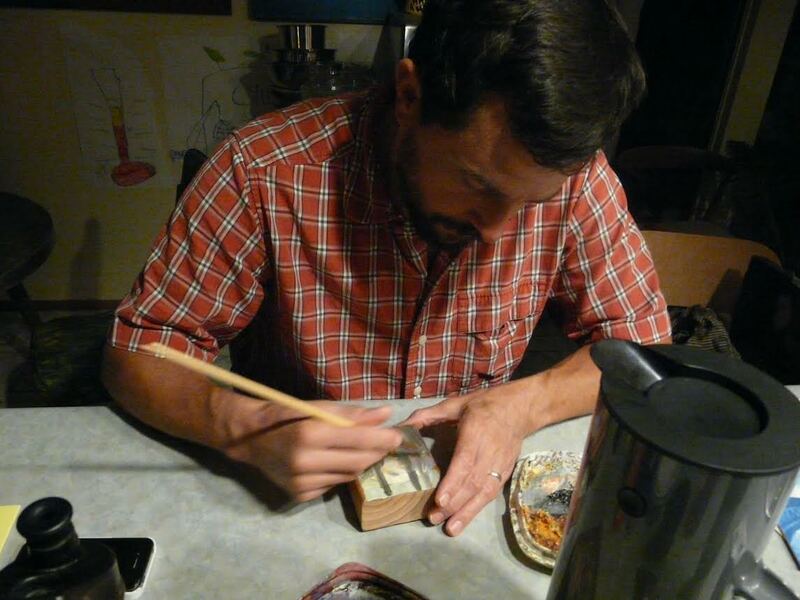 The 2×4 is something I had on hand – also it’s something cheap and something we take for granted. Your tagline is “Humble art for humble folk.” Who is your audience? I usually paint for the person I was twenty years ago, and the person I’ll be twenty years from now – the novice collector who just knows what they like, as well as someone more experienced who’s looking for something new. 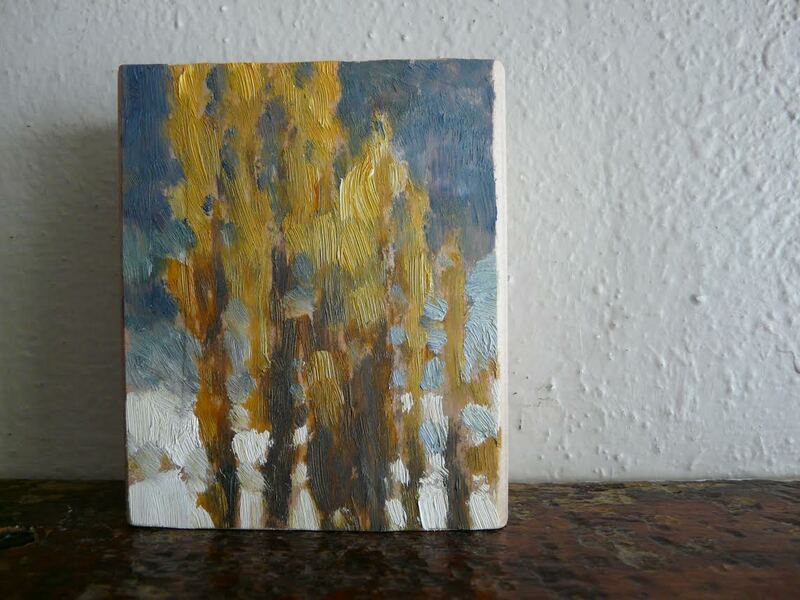 As for the paintings, the humble bit means, yes, they’re affordable and diminutive and can be put anywhere. In terms of the audience, they don’t really have to be humble – it’s just a tagline. We love the snippets of nature in all your paintings. Do you paint them directly from life? These are not painted from life – they’re from photos I’ve taken. Whenever I’m out and about I always take my iPhone. I used to be very against this type of thing – a plein air (painting on site) purist you might say – but now that I have two little boys my self-righteousness has slackened a bit (along with everything else) and I’ve realized that the important thing is simply to paint. Plein air will always be the ideal, but in addition to being time consuming (travel time, set up, take down) and finicky (you can’t do it after dark), the failure rate can be high. And I don’t have a lot of space for failure in my life right now. I just hope that my years of experience as a plein air painter can imbue these pieces with enough authenticity to make them acceptable to the remaining purists, god bless them. What has it been like to work with KOBO? For me, working with KOBO is kind of like landing a role in the new Star Wars movie. I’ve known and loved the shop for so long, to finally be a part of it feels both inevitable and also like a dream. And the way it all came to pass couldn’t have been more perfect – I was in the shop one day and the thought occurred to me for the first time and I said to myself, “Why not?” I introduced myself to [co-owner] Binko then and there and by the end of the week I was bringing in some work. It doesn’t ever go that way.